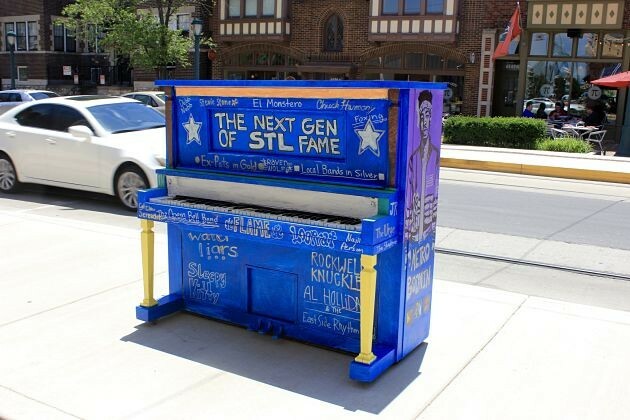 What's Up With Those Colorful Pianos Popping Up All Around St. Louis? El Monstero, Rockwell Knuckles, Sleepy Kitty and more are listed on the "Next Gen of STL Fame" piano in the Delmar Loop. Over the past few days you may have noticed an assortment of pianos placed along the Loop and other popular spots in St. Louis. You might have wondered, "Why the hell are those here?" Well, we've got your answer for ya. June 21 will mark the second annual "Make Music Day St. Louis." It is a day set aside to celebrate music in all of its forms, encouraging people to band together and play free public concerts anywhere and everywhere they can. This celebration is a part of the international "Fete de la Musique" which originated in France and now takes place annually in 700 cities across 120 countries. A whopping 36 U.S. cities will participate this year, along with the entire state of Vermont. Recently, Make Music St. Louis, Inc. placed eight pianos in the Loop along the trolley stops for public use. Over Memorial Day weekend, local artists painted each of the pianos to give them their own personal flare. One piano, entitled "The Next Gen of STL Fame," celebrates local and native STL musicians on the rise, such as Metro Boomin, Pokey LaFarge, SZA, Jeff Tweedy, Angel Olsen, Tef Poe and Smino. Other pianos have also been placed in Strauss Park in Grand Center, at the Riverfront by the Arch, at the National Blues Museum, the Central West End, Clayton and Ferguson. Yes, they are real, functioning pianos. And yes, you can play them — no need to wait for June 21 to start plunking away. If you've dreamed of giving your very own concert to commuters making their way along Delmar (or through the Central West End, or Ferguson, or wherever! ), this is the moment you've been waiting for. Make Music Day is presented by the NAMM Foundation and coordinated by the nonprofit Make Music Alliance. Learn more about Make Music Day St. Louis at http://www.makemusicstl.org/.